Looking for a unique and fun way to celebrate Easter? 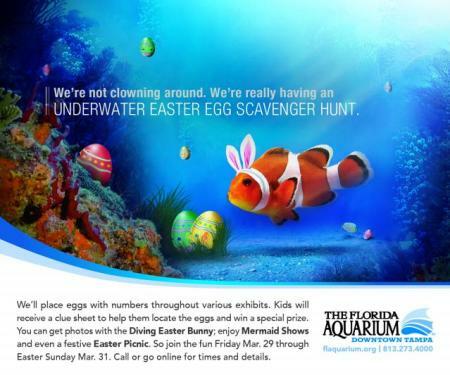 The Florida Aquarium is putting a twist on traditional Easter festivities with an underwater Easter egg scavenger hunt from March 29-31. Kids will receive clues to help them find the numbered eggs hidden throughout the exhibits. There&apos;s a special prize for those who find all the eggs! There will also be photo opportunities with the Easter Bunny (on land and underwater), mermaid shows, and an Easter picnic. The picnic, which includes country fried chicken, BBQ ribs, baked beans, potato salad, coleslaw, corn bread, and cookies and brownies, will be from 11 a.m. - 3:30 p.m.
Aquarium admission and Easter picnic combo tickets can be purchased online or at the ticket booth. Check out more fun Easter activities happening around Tampa Bay!